I’m totally hooked! The art is amazing, the colouring is beautiful and the new companion is absolutely lovely! 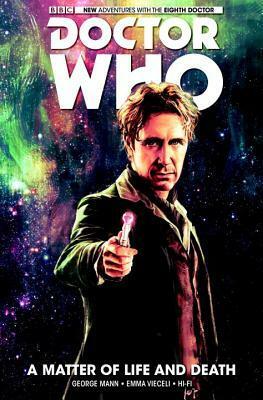 A Matter of Life and Death features the Eighth Doctor who sweeps through time and space in a giddy fashion – as usual – craving a cup of tea all the while – as usual – leaving the work of saving worlds to others – as… wait, what?? Yes, quite surprisingly, the Doctor mostly leans back in this one and watches as Josie, a blue-haired Welsh painter girl, takes on his role and thus proves she is worthy to become a regular companion. We follow them through six loosely connected stories that involve singing crystals, murderous plants, evil reflections and many more fascinating wrong-doers. I believe the writers found a perfect way to introduce a new companion and I didn’t mind at all that the Doctor was only present as a helper/mentor figure. I liked that there were a lot of emotions floating around, especially towards the end and it was good to see how the Doctor’s philosophy – ‘everyone counts’– got addressed in the final chapter. I always found the idea of parallel universes cool. In A Darker Shade of Magic this theme is spiced up with magic and the combination results in a highly enjoyable book. 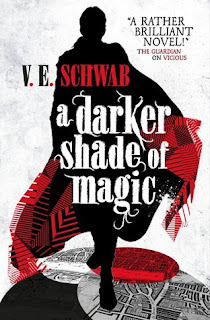 V. E. Schwab’s novel is fast paced, action packed, funny and pulls at your heart-strings occasionally; all in all it is a good start to a series. Kell is an Antari, a blood magician, one of the two survivors of his kind. He has the rare ability to travel between Red, Grey and White London, cities that were sealed off from each other after powerful magic consumed Black London and its populace. After a token from the fourth world ends up in Kell’s possession hell breaks loose and the Antari is the only one who has a chance to keep the threating wave of black magic in bay and thus save the remaining Londons. He doesn’t have to deal with the situation completely alone of course, he has a badass sidekick, Lila. Lila Bard is the kind of heroine I cannot resist falling in love with. She is sassy, cool on the surface, but vulnerable inside and craves adventure. 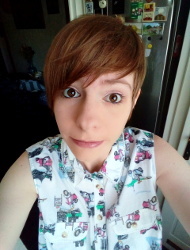 She is a cross-dresser wannabe pirate; what’s not to love about her? For me she came across as a much better-rounded character than Kell, but it didn’t bother me since I loved her very much. I loved the adventure, the speed with which the story commenced, it drew me in, kept me excited and left me wanting to read the second book. It’s great how the Londons are similar, yet completely different, how the connections with magic define the worlds and I also liked that magic is a two-edged instrument in the story. All in all: A+, would recommend.